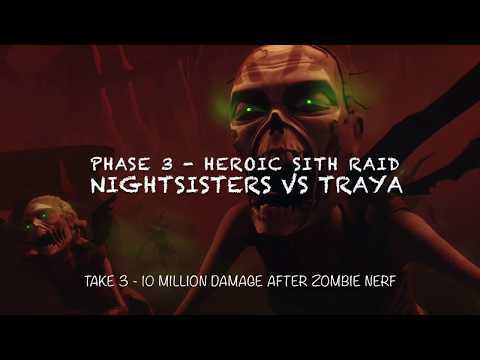 I’m not the first to report this, and overall this was actually a poor run, but I wanted to post this video so everyone can see that Nightsisters still work just fine in P3. Overall I will concede this is a slight nerf, but on my typical 15 million damage runs I think this will only slice off about 2 million damage. On this particular run I “only” did 10.6 million because Daka got dazed and I only lasted 1 turn into enrage. Hey, Bulldog. Thank you for posting this. Makes total sense and I appreciate you posting, your time and solutions. Are you running Fat zombie? Your health and Prot are off the hook for just speed and pot mods. I went full out speed on zombie. +130 think? I have her big G12 pieces that give tons of health though. I noticed the GS12 pieces. Maximum effort. Thank you. Nah but seriously, please stop promoting this cheesy loop wannabe tactic. It's saddening. Too much RNG and planning to do vs Chex Mix. Compared to Chex mix? There is plenty of RNG, but not by that standard. I just had my 2nd raid yesterday since the change and unfortunately was at work. I took only a single try and for 10.1 million, while making several mistakes because I wasn’t supposed to be on my phone at work. So I’ve now topped 10 million on 3/8 attempts. Yes, there are some things that can go wrong that you can’t control and will demand a restart. But getting a quality run it shouldn’t be something that required a ton of restarts.